The comic book industry in the United States as a whole has been owned by super heroes for decades now. There have been ups and downs for other genres and sub-genres but for the most part, the big 2 which own the majority of the industry in the US are essentially super hero character licensing companies. And what this to some degree means is that all those people reading those comic books have essentially just super hero comics to look up to. Now, all good writing programs and classes tell you not to just find inspiration in reading from the format you intend to write. But as we all know, many of us are inspired by a format and there are lots tons of devoted fanboys/girls out there that read nothing but comics (as I said above, predominantly super hero comics). What this means is that when they write the medium, they bring nothing new to the format than what they and dozens like them have read. Often, this breeds comics that only reference other comics. 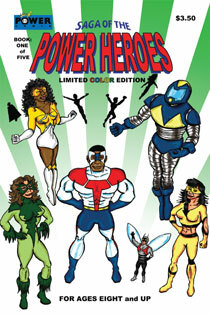 For better or worse, that’s what Saga of the Power Heroes: The Preventers comes from. The Preventers is not a bad book, it just brings nothing new to the industry. In some ways, it’s a perfect book. It is exactly what decades of people reading nothing but super hero comic books has lead to. The Preventers are a group of super-powered beings much like The Avengers, The Defenders, Justice League America/International/Dark, etc. Each of the members fits an archetype that was already established as necessary by the above mentioned titles. There’s the tech guy, the super-chick, the shrinking dude, the fast character, etc. They have government backing, they “do the right thing” for all the right reasons and they wear skin-tights. Where The Preventers breaks mold and becomes interesting is that the characters have more skin-color variations and women than most of the above mentioned teams (maybe all of them combined). So, while I don’t feel a need to read the rest of the issues of The Preventers, I think it has a place. It would be great for kids. It’s fun, satiates all of those needs for guys in caps and powerful women, and it’s not in the least bit harmful. In fact, I think that The Preventers would be a great comic to introduce kids to comic books without bringing up adult themes that should come up (but often do not) in other, more mainstream comics. The Preventers should be part of some monthly reader/magazine/newspaper that gets distributed to kids in schools. If you’re looking for something for kids, a book that will do no harm, The Preventers is for you. This entry was posted in Columns and tagged comic book, Derrick Rivers, indie super hero comic book, power comix, saga of power heroes, super hero comic book, the preventers. Bookmark the permalink. Follow any comments here with the RSS feed for this post. Post a comment or leave a trackback: Trackback URL.